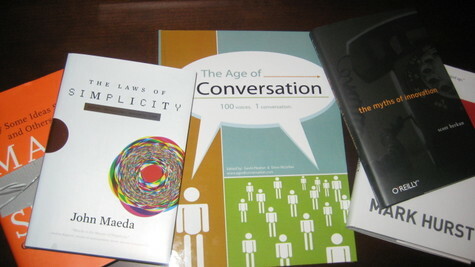 Got my Age of Conversation hardcover today. Suppose I could write something about this—but let's test out the old adage shall we? Is a picture really worth a thousand words? I've been told a couple of times over the past few months to "grow up". Not in a malicious way--maybe in a bit more dismissive manner. But what do the "grown ups" know that I don't? 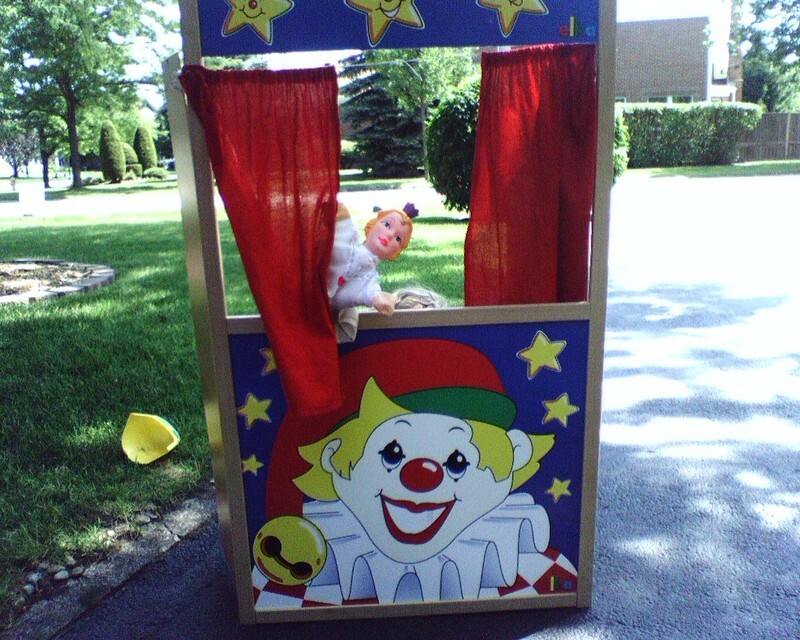 Do they drop what they are doing to make time for life's little "puppet shows"? Have they kept their sense of wonder--and humor? Do they still dare to dream? In my limited experience in life I've learned that there is a subtle difference between being a responsible adult, professional, citizen and being a "grown up". As children we aspired to be "grown ups"--we couldn't wait until the day it was our turn. Then one morning we woke up and wondered what the fuss was about. If you've lost your appreciation for a spontaineous puppet show, then chances are that you've probably "grown up". Is it everything that you thought it would be? "I want to work in a small creative operation. I am staying here in the states. I love it over here". ~Rodd Chant, former executive creative director, Draft FCB. "Why oh why do people in this day age still hold up “usability” as something laudable in product and service design? Praising usability is like giving me a gold star for remembering that I have to put each leg in a *different* place in my pants to put them on." "'Ive been spending much time with ad agencies and focus groups lately and can only conclude that--with some exceptions--they are mostly clueless." 6. The network is exists. 8. The network is flowing." A belated kudos to Todd who recently had his innovative blog ranking formula acquired by AdAge. Todd's "algorithm" is updated in real time and combines Google page rank with Technorati, Bloglines & "Todd And" points in order to gauge the popularity of a blog. I'm too lazy to write a new post about this, so I'll just reference an oldie but hopefully goodie which I think is related to the potential impact of AdAge's newest addition. Enjoy. “The soiree was swell I have now gone over to the dark side--to bloggers in the battle with MainStream Media. Of course, not all MSM folks refuse to get the idea of community, collaboration and conversation. My own boss at BW totally gets it. But there were so many at Davos who didn't. Hello. This post is for you. Yes, you. You're here listening—watching—observing. You read our thoughts, sometimes even follow along in our lives. You wonder how we can share so freely, in blogs—through the full spectrum of social media venues. You watch the memes spread and find out even more about us—about our personal lives and past experiences. You sign up for our e-mails and feeds. You supplement your daily flow of mainstream information with what we have to say. But you don't talk back—even though you can. The current meme traversing through our networks asks us to share 8 random things about us. It's so easy for "us" to pull up our instant publishing tools and throw our thoughts out to the Web. But you can too. Take a good look at that comment box pictured above. It's instant publishing. Just like what "we" have—only with a few less bells and whistles. What are you waiting for? Tell us about you. Use any name or identity you want. Go ahead—get it off your chest. "We" do it all the time—and now it's your turn. Aren't you curious to see how it feels? Conventional wisdom teaches us that just because we can do something, doesn't mean we should. And it's true—and wise. But it's also conventional. So I wondered what it would look like if I created my own poll? Just because I could do it, I guess. And what if I put some less recognizable names on the list? What does the next generation look like? The results were pretty interesting. Jesse James Garret , Jared Spool and Donald Norman came in at the top 3 on "my" list. vs. Jakob Nielsen, Steve Krug and Jared again (nice to see Jared on both lists in the top 3). And as for the "up-and-coming" list, Luke Wroblewski, Dan Saffer and Dan Brown came in at the top 3 spots. A big miss on my part was not including a heavyweight such as Alan Cooper in the "established" list, but it was too late to modify the lists (though it should be noted that his name came up several times in the "other" category). I don't think this exercise proves much other than that we now have alternative choices for this type of thing as delivered via social media. For every e-consultancy type listing, we get to present another viewpoint—a different perspective. It's worth noting that the Poll was limited to 138 participants, but you should not underestimate what this means. I'm fortunate enough to have a very "plugged in" audience here—practitioners in the field who know what they are talking about. So while the poll isn't exceptionally quantitative, you have to think about the qualitative aspect. Lastly, I thought it would be interesting to see the "established" and "up and coming" names in contrast. Though folks like Leisa and Stephen P. Anderson didn't make it in the "top 3"—I am convinced that folks like these are rising stars and we will see/hear more from them in the future. So don't take any of this too seriously—if your name isn't on either list, it doesn't really mean a heck of a lot. There are plenty of practitioners quietly innovating in the field, doing the day-to-day heavy lifting. Many of the names here represent individuals who are sharing knowledge in addition to practicing—or in some cases, they are just plain visible. If nothing else, the "extended" lists are a bit more interesting in comparison to the e-consultancy version. At least I think they are. Every time I pick up an iPhone, I am delighted and disappointed in the same breath. Apple has completely nailed the UI, and the industrial design of a new breed of "smart phone". The iPhone is so intuitive—so pleasurable, it's addictive. But I can't get over the fact that a design like this can't support a tactile, usable keyboard. So—I've mocked up something in the hopes that one day—someone will figure out how to combine the amazing experience Apple has delivered, with a totally usable keyboard that doesn't take up 3/4 of your screen when using it in the horizontal format. Enter the "myPhone". Imagine taking the best slider design out there, like Nokia's N95, then adding a responsive trackball similar to the Blackberry Pearl. Yes, you would add some thickness to the iPhone design. This may turn off some Apple die hards who place a premium on the simplicity and elegance of Apple's designs. But I have to believe that someone out there—someone can provide a UI experience similar to what Apple has achieved without sacrificing the ability to enjoy tapping out lots of copy on a responsive QWERTY. And what about copy and paste? Currently the iPhone doesn't support this. I may be dreaming, but a design like this could really enhance the mobile Web experience. More input. More interaction. All of the touch screen magic would still be there. All of the accents such as the chrome. The trackball could allow for one hand operation—I know this because I do it on my Sideckick all the time. Actually, if I had something like this in my hands, I might use both my thumbs and index fingers at the same time. I don't know. Many feel that Apple's design is perfect. For me it's close. But I can't get over the typing experience. It's just not good when you compare it to much larger, tactile QWERTY's. There has to be a way to make this work. Are we ready to go to all touch screen even when it doesn't feel right? Am I the only one who feels this way? This isn't a criticism of the iPhone. It's a brilliant piece of art and technology and extremely well designed. I may cave in and get one—I don't know how much longer I can hold out. But innovation sometimes happens when a need goes unmet. So far no one has nailed the mobile experience for me. I can't believe that I would be alone in this. The "myPhone" pictured above would also be able to take video, and allow you to edit certain documents. 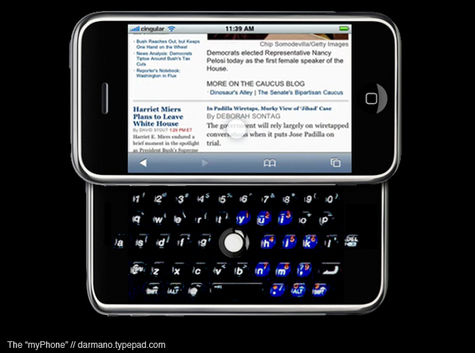 Imagine putting that little keyboard to use on a word doc or presentation when you are on the go. And imagine how good the mobile blogging experience would be. Or I could just be smoking something. Want some? Hmmmm, I wonder what Jakob Nielson would say about me posting this video? I mean, it's kind of interesting and I think the voice reminds me of Ricardo Montalban saying "Corinthian Leather" in the old Chrysler Cordoba ads. But Jakob says blogs should contain articles—not blog posts, in order to maximize the chances of a blog being successful. What's a Web author supposed to do? I'm too tired to write an article. Sometimes we just want to share something we recently saw (or experienced). Sorry Jakob, next time I'll write an article. In the meantime, enjoy the video. It's a bit far fetched in a science fiction kind of way—but worth watching. Be sure to watch to the end, that's where "experience is the new reality" comes in. 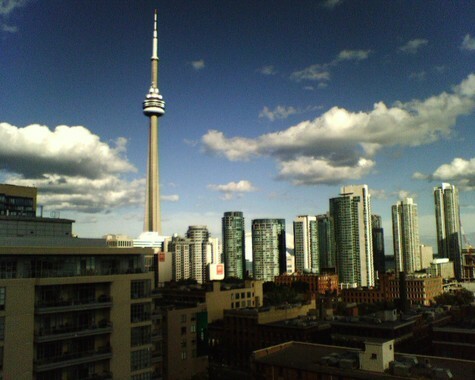 The view from the Critical Mass "penthouse office" in Toronto. The bus gets ready to leave to go to the "Summer event" venue. At the summer event location. 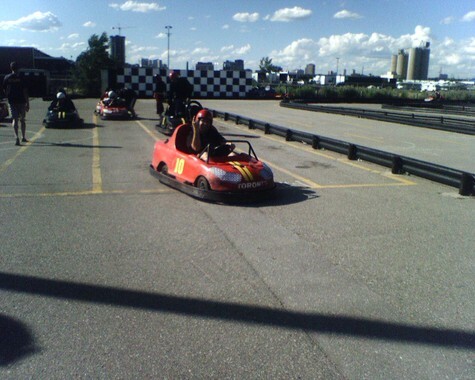 Tomorrow I'm off to Toronto to attend "Summer Event". Every year, Critical Mass holds a 2 day "festival" complete with creative exercises, music and lots of beer. I am going to be part of the "speaker series"—so I had to come up with something to talk about. I guess I could have blathered on about "2.0" stuff. 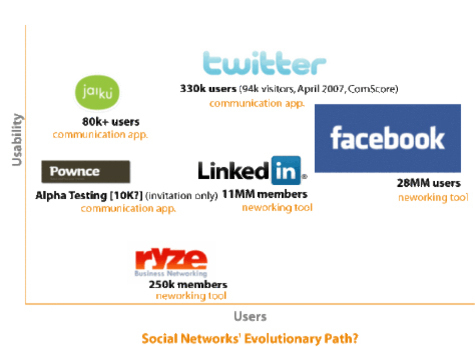 Social Networks this and community that... I could have dazzled the audience with my knowledge of the newest lingo like Pounce, Ziggs and of course BouGie. What I opted to do instead is talk about something much more subtle. The changes that we are all feeling in the workplace and within our industries which are requiring us to think and work slightly differently. We can no longer afford to over-analyze our challenges. We must try to get things launched—learn from these experiences and refine. We must define ourselves and what we do more broadly while retaining the potency of our our crafts. It's about going from left brain to right brain and ending up on "light brain". We must become "fuzzy". Being fuzzy as I outline in the deck is about unlearning everything we think we know—so we can actually learn and adapt. It's about less focus on rigid tasks and job descriptions and more focus on bringing our efforts together in the overlaps—where our skills compliment each other. It's about being more nimble and adopting "fuzzy" processes to compliment our tried and true methods that have served us well in the past. The Fuzzy Tail is my way of saying "we won't become the blacksmiths of our time". It's about pushing past the commodity—the end product or service which can be outsourced. It's about putting aside egos, getting out of silos and mixing it up with each other—I mean really mixing it up. Planners who think like designers—designers who obsess about business—information architects who write—writers who act like strategists—project managers who can direct creative and creative directors who are willing to let them. People who are willing to let others play in their sandbox. Well' that's the thinking anyway. We'll see how it goes over. 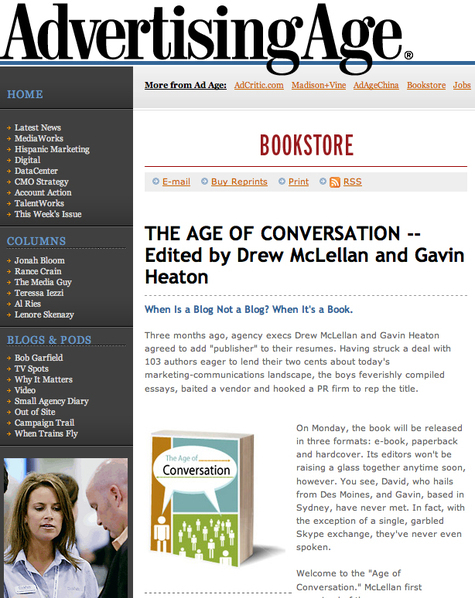 The Age of Conversation Book comes out next Monday. Here's a mock up of what it will look like. I've created a permanent page here which I'll update as events related to the book unfold. The book includes contributions from over 100 Web authors (i.e. people with blogs)—and ALL proceeds go to a good cause. 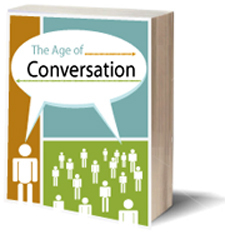 For more info, visit the Age of Conversation page. 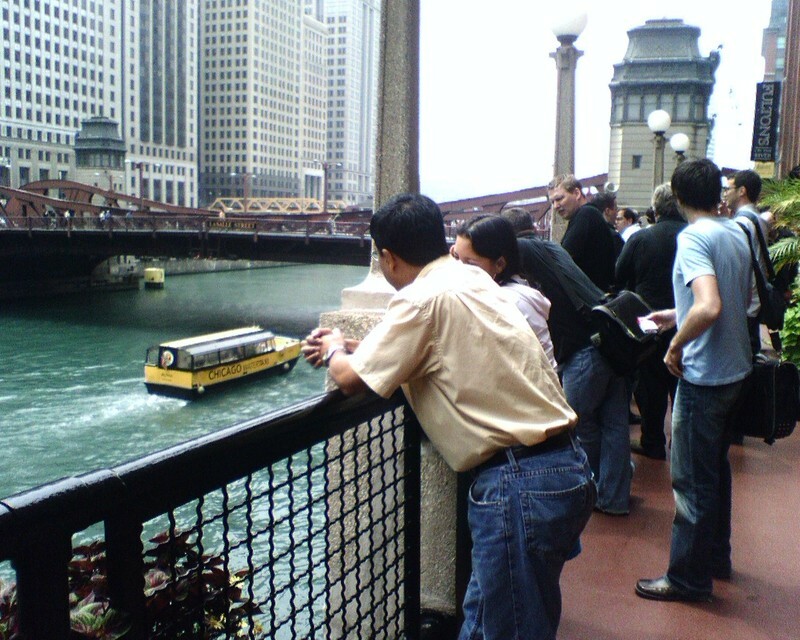 At some point I'll do a breakdown of why Millenium park in Chicago is a good experience, but for now--here's a picture of the "towers" in use. This particular part of the park invites people to interact with it, to surround yourself within it's "mini ecosystem". Each tower displays rotating videos showing people's facial expressions. Every five minutes or so, one of the faces "puckers up" and sprays cool water on the participants splashing their way through the fountain. Valeria Maltoni over at Conversation Agent has pulled together a nice summary of the topic that's been on everyone's mind: Are we being overwhelmed by social applications? "Why do we need so many tools for social interactions? Have we suddenly become incapable of interacting with our friends, neighbors and colleagues? And now that we have social networks are blogs obsolete?" Andy Rutledge offers up a thoughtful piece of commentary on why he feels the CNN re-design is a success. The post includes visuals and is a must read for designers. "One of the basic, overriding elements featured in CNN’s new website design and layout is something I like to call quiet structure. Quiet structure is achieved when you de–emphasize the structural elements; the containing boxes, structural lines, bullets, structural color elements, etc… and bring a rhythmical consistency to the layout. The result is that the content becomes more conspicuous and the overall clarity of presentation is greatly enhanced." Kevin McCullagh says that design is changing in a myriad of ways. He's right—and it's not just design. "The era of product design as practiced by a small band of gurus in Milan, London, Munich and New York is long gone. There are now thousands of competent product designers around the world able to 'give good form.' Design as 'styling' or 'form-giving' has become commoditized, and competing at this level is already a tough low-margin slog." "I like to hire folks with a broad range of interests and who have switched fields at least once. Just as learning a foreign language gives you the confidence and knowledge to learn others, switching fields gives people the assurance and tools to tackle new problems." A little visual brain food to get your day started off right, compliments of Mike Press. July 4th in Glenview, IL. 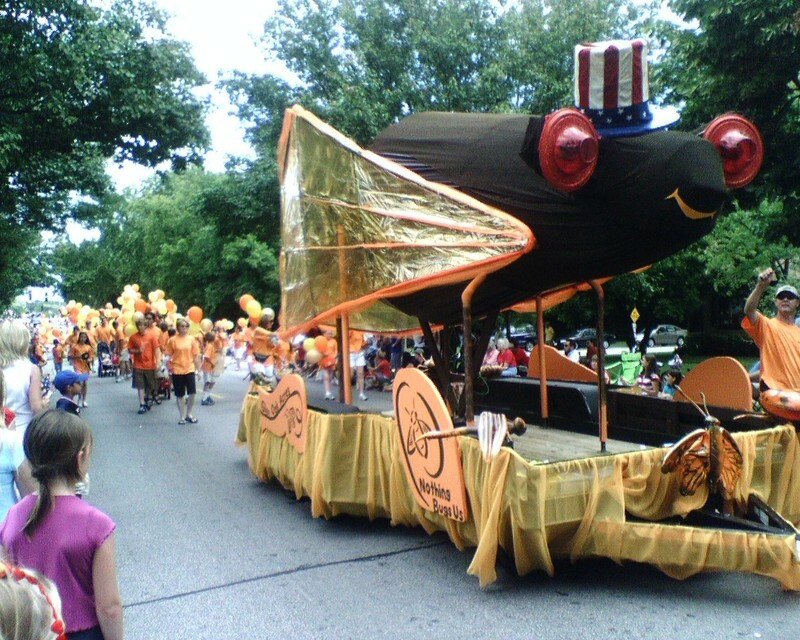 If you are wondering what's on the float, it's a Cicada--Illinois' unofficial state bird (or at least they should be). Cicadas are the size of a small child, and they have a habbit of flying directly into you at high speeds using their little cat-like claws to secure themselves, requiring a crowbar to pry them off. And don't you get me started on how noisy they are. Yup, I have a soft spot for the little insect monsters. Can't you tell? "One side note that I only discovered after doing this video is the iPhone doesn’t do video at all, which I was really surprised about. When Paul was editing he put his Nokia fan boy bumper that said “you can watch this on an iPhone but you couldn’t make it” and I actually argued with him on that point, I thought video was assumed." I give a lot of credit to Karl for going out there and using a Nokia phone to document the power of Apple. When the competition heats up—you should absolutely get out there to see what's going on. And in this case, Karl and team hit the pavement to see first hand. Speaking of Nokia—I absolutely love this slideshow they produced. I don't own a Nokia phone. If anyone out there does, do you feel the sideshow is consistent with your experience with Nokia? Update: Don't believe the hype.